Having a beautiful property is a lot about maintaining it right. Maintenance is never a one-time job and any landscape needs constant and expert attention to keep it healthy and looking new. Just as mowing, pruning, trimming, cleaning and power-washing are an essential part of any landscape maintenance, it is also important to pay attention to irrigation and drainage services. When California Creations handles any landscaping projects, we make sure that all the irrigation and drainage aspects are planned and installed to perfection. But if you have an existing landscape which has water pooling or flooding issues, it can do significant amount of damage to your property. 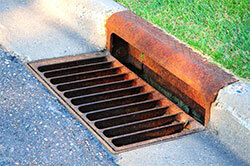 Just as we handle all landscape maintenance work, we also provide drainage services to customers across the region. If you find any kind of pooling of water on your property, we are the company to call. We will survey the land and identify where the problem lies. 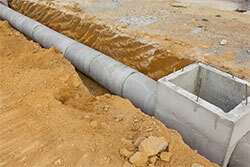 Based on what the problem is and its severity, we will then provide you with suitable and customized drainage services. We ensure that the work is carried out with the least amount of disruption and that the entire task is carried out in a methodical and specialized manner. 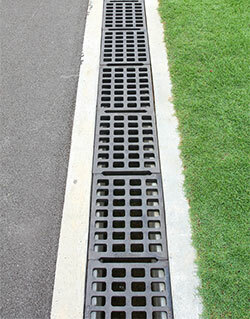 In addition to the different types of drains mentioned above, we may install foundation drains or will install gutters or storm water drains as required. The aim of all this planning and mix-and-match of solutions is to ensure that your property stays free of standing or pooling water.